HCM CITY (VNS)— To combat the flooding plaguing HCM City, authorities will prioritise the construction of eight tide-control culverts and speed up zoning plans for reservoirs. The announcement was made by the city Department of Transport following the severe floods on September 15 caused by the "historic" showers. Seventy two streets had been submerged 10 to 60 cm under water, with Nguyen Huu Canh, Go Dua, Ho Van Tu, To Ngoc Van, Do Xuan Hop, Quoc Huong, La Xuan Oai, and Kinh Duong Vuong being the worst affected. The outdated and overloaded drainage system and climate change were blamed for the flooding. To mitigate the problem, the department will step up inspections of drainage systems and improve flood response operations. In the longer term, implementation of the master plan for drainage and combating floods approved by the Government in 2008 will be speeded up. It includes the eight tide-control culverts. Prime Minister Nguyen Tan Dung has called on the city administration to step up efforts to stop the flooding that plagues the inner districts. The city needs to keep a close eye on zoning plans for reservoirs and speed up construction of new reservoirs to reduce flooding, he has said in an official correspondence in August. It has to dredge its canals to facilitate drainage and reduce flooding, and funds for water drainage and flood prevention works have to be raises by related ministries, agencies and the city People's Committee, he said. The money could be obtained from the Government and ODA loans and raised through public-private partnerships and by utilising its lands and other means, he added. The Government has approved zoning plans for water drainage that focus on combating floods in the city centre. It has instructed the Ministry of Agriculture and Rural Development to collaborate with HCM City and Long An Province to devise measures to combat floods in South Sai Gon. According to the HCM City Flood Combating Centre, the height of the tides have been increasing in the last few years due to climate change, and will worsen the flooding if the city does not take effective counter measures. Figures from the centre reveal that the highest tide recorded at the Phu An Hydrological Station was 1.68m in 2013. But between 2011 and 2014 tides of over 1.5m have occurred 76 times while almost two-thirds of the city lies at an altitude of less than 1.5 metres above sea level. 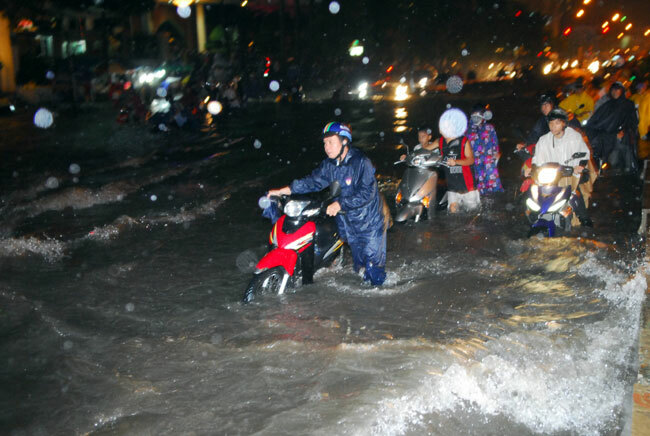 All necessary works to eliminate flooding would cost HCM City VND51.3 trillion (over US$2.3 billion) in the next five years, a meeting held in July to discuss flood control heard. They include building storm water drains, a tide-control system and wastewater treatment facilities, according to the HCM City Flood Combating Centre. To protect the inner districts from flooding, the city needs eight tide-control culverts, 68 sewers and hundreds of kilometres of embankment along the Sai Gon River and extensive network of canals.